Osong is looking to solidify its position as the country’s mecca for biotechnology research with the upcoming Bio Industry Expo Osong Korea 2014. The event, slated to be held in the North Chungcheong Province city, will provide opportunities for corporations in and out of Korea to gather and share business propositions on medical facilities, medicine and aesthetic products. Some 230 leading companies in the field around the globe are expected to take part in the 17-day event from Sept. 26 to Oct. 12. Companies expected to participate include global giants Merck, Siemens, Sino Pharm and Shanghai Pharma as well as local firm Boryung Pharmaceutical Company, beauty brand The Faceshop and LG Life Sciences Ltd., LG Group’s pharmaceutical affiliate. “The expo will host leaders in the bio industry around the world. It will be an opportunity not only for North Chungcheong Province, but for Korea as a whole to elevate the level of its bio industry,” said Lee Cha-young, secretary-general of the organizing committee. It will not just focus on giants, but will encourage them to partner with Korea’s small and medium-sized companies in investments and in research and development, organizers said. The expo will also host conferences with world-renowned biologists expected to attend, such as 2004 Nobel Prize winner Aaron Ciechanover, who won the prestigious prize in chemistry for the discovery of ubiquitin-mediated protein degradation. The event follows Korea’s first-ever international biotech expo in 2002, but with a much greater scale, more participants and a higher level of competence, organizers said. “North Chungcheong already secured its place as an industry leader with the 2002 event, when it introduced Korea’s biotechnology. We are hoping this year’s event will propel the province to the center of the global bio industry,” Lee said. 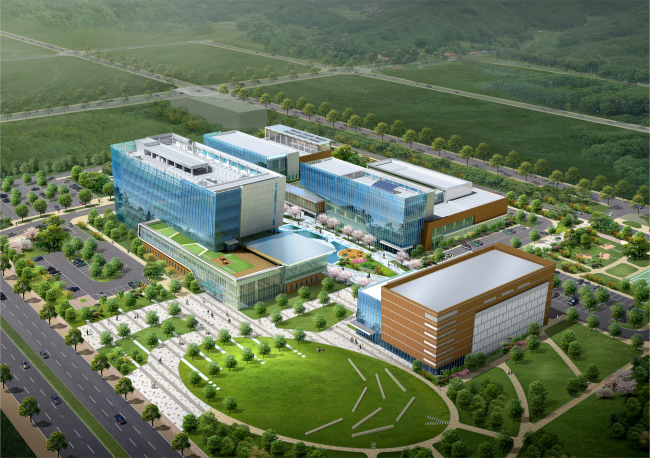 Osong, a stone’s throw from the country’s administrative capital of Sejong, appears to be just the place for an international biotechnology festival given that it is already the home to Osong Life Science Cluster, the country’s only bio industrial cluster. The Osong High-Tech Composite Medical Complex consists of high-end research facilities on drug development and testing. Its medical device development center has cutting-edge technology such as 3-D printing, which they utilize to create precise models of human bodies. The center also hosts facilities for performing various safety tests, such as sensitivity to electromagnetic waves. “Most electric devices are susceptible to such waves, such as the TV screen flickering when you turn on the light inside a room. With our facilities we can make sure our life-sustaining devices like pacemakers are not prone to such problems,” said a researcher from the center. In addition to making medical facilities, the Laboratory Animal Center at the complex holds one of the most advanced technologies for animal testing in Korea. It has the technology to conduct MRI and PET scans on larger animals such as dogs and pigs, unlike most facilities in the country. The exhibitions at the expo will provide sneak preview of the technology at the Osong complex. Various experiences for the attendees will be available, including antiaging products, a quick diagnosis program for the elderly and a space where students can learn about biotechnology. It will touch on not only the drugs, but other aspects like bioenergy, which many experts presume holds the key to solving fuel shortage problems that mankind will face in the future.